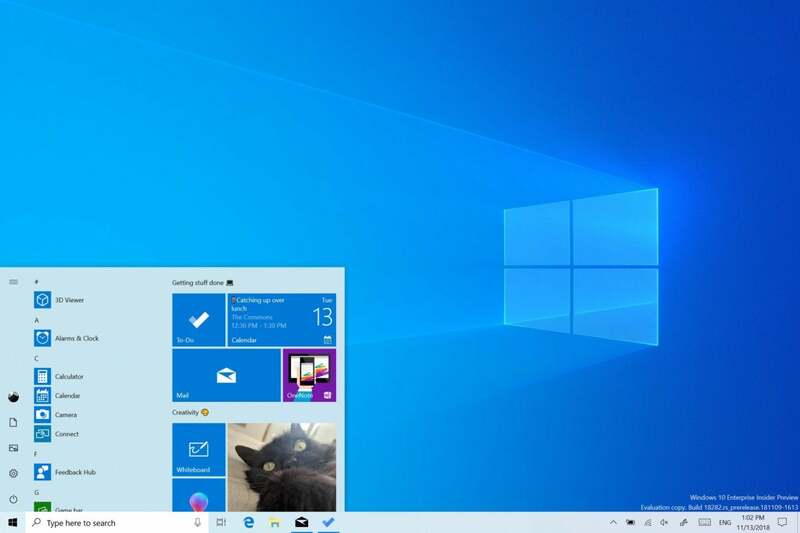 The headline feature of Windows 10 Insider build 18282 is probably the “light theme” for your Windows desktop. But the most useful addition is the new, Intelligent Active Hours designed to present unwanted interruptions from Windows updates. You’re probably aware of the existing Windows “dark theme,” which uses darker colors and accents to soften the vast expanses of white within Explorer, Edge, and so on. And you probably thought that the existing light theme was an alternative to that. Well, not so much, apparently. Behold the new “light mode” for Windows 10. If you do already have a light theme enabled, Microsoft won’t shift your PC over to the new light (lighter?) theme. (Remember, shifting between any themes may be done within Settings > Personalization > Colors.) Instead, your PC will exist in a “Custom” state. You can then manually select which mode you prefer. There’s also a new “Windows Light” wallpaper under Settings > Personalization > Themes. Microsoft promised that Windows Update would become more intelligent in the April 2018 Update, then mumbled and kicked the ground when asked where it was. 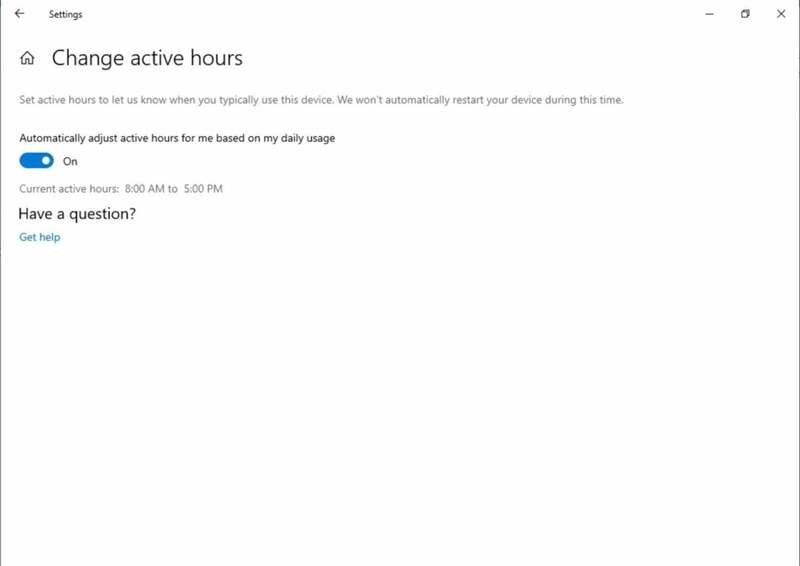 Microsoft has debuted what it calls “Intelligent Active Hours” in build 18282, which is designed to automatically adjust Active Hours based on your behavior. Active Hours, if you don’t know, is the time when you don’t want Microsoft to kick off a Windows update, i.e., when you’re actively using your PC. 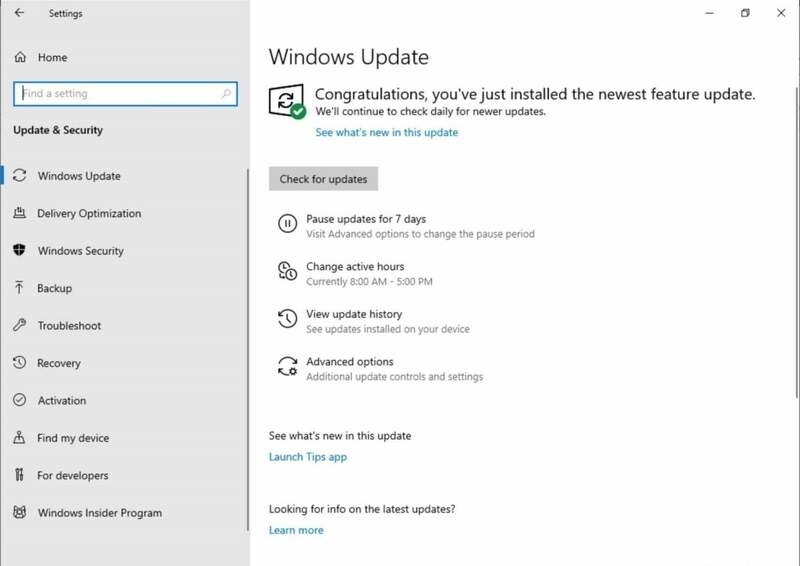 You will need to enable this setting manually, though, via Settings > Update and Security > Windows Update > Change active hours. Here’s the control to turn on Intelligent Active Hours. 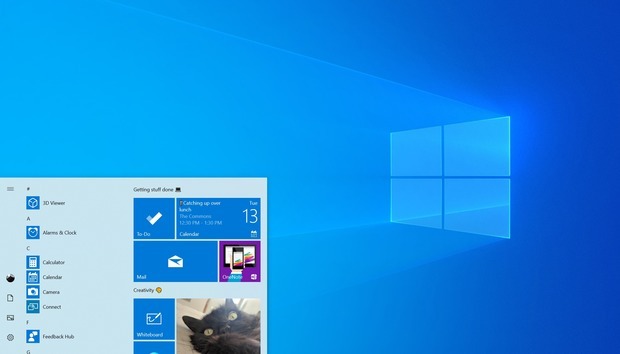 Now it’s even more convenient than before to pause Windows 10 updates. Personally, Snip & Sketch seems like Microsoft reinventing the wheel once again, doing away with the perfectly functional Snipping Tool to add another utility that does largely the same thing, albeit with inking capabilities. Microsoft’s been busy bringing Skip & Sketch back up to par with the Snipping Tool—it recently added a delay feature, and this new build now allows you to select a window automatically. Snip & Sketch’s window snip, in action. 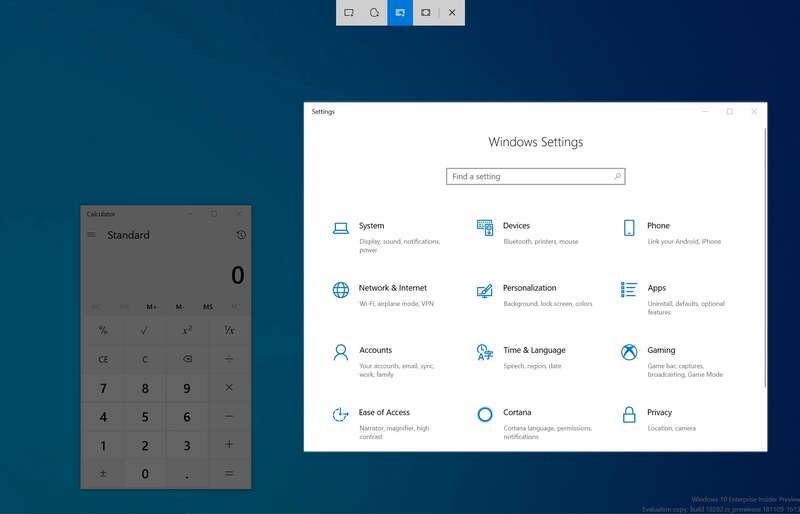 Printing under the new build hasn’t changed all that much, but Microsoft has added some icons and explanatory text to let you know which features does what. One of the oddities about Windows is that sometimes the brightness will change when you switch between AC power and your laptop’s battery. With 19H1, that won’t happen—your screen brightness will remain the same whatever mode you’re in. The only exception will be the battery saver mode, where your screen may dim if you’ve configured it to reduce the brightness to save battery. 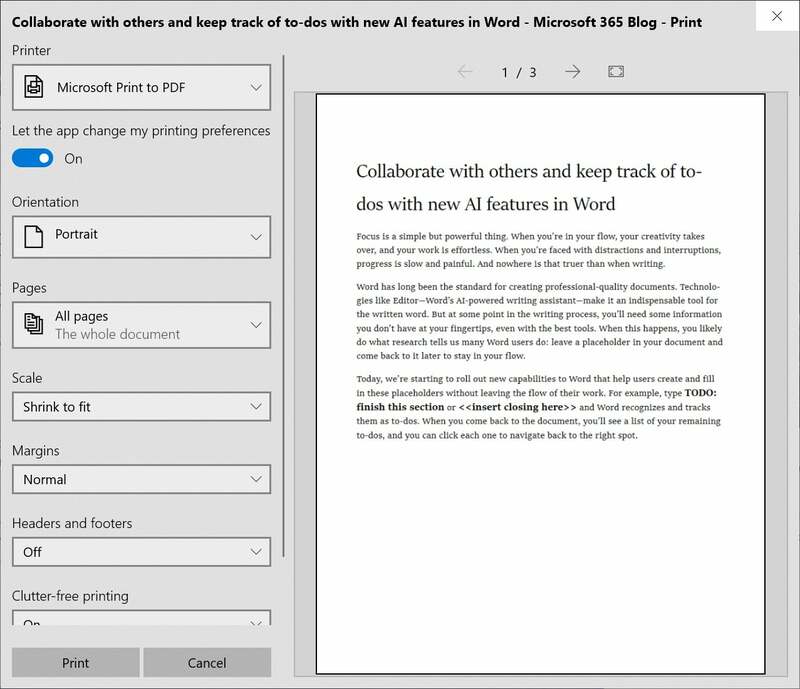 Microsoft has added a few other improvements: Narrator will become more verbose, to provide additional information to those users who have problems reading the screen; and the OneDrive flyout has also received a dark mode, too. As we head into the holidays, this is also the time in the Windows development cycle where Microsoft begins adding more features to Windows—stay tuned for more.